The Tallest Tiranga was hoisted in Faridabad under the aegis of Faridabad Navchetna Trust to commemorate National Defence Day on 3rd March, 2015. 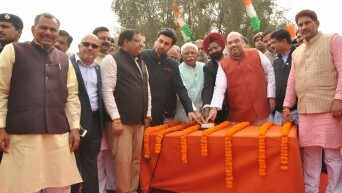 Faridabad was witness to a historical moment in time when the world’s Tallest Tiranga was hoisted at the HUDA Town Park in Sector 12 by eminent dignitaries Shri Amit Shah, National President, Bharatiya Janta Party; Hon’ble Chief Minister of Haryana Shri Manohar Lal; Sh. Dharmendra Pradhan, MOS (IC), Govt. of India; Sh. Subhash Barala, President, BJP Haryana Unit; Dr. Anil Jain, National Secretary, BJP & Incharge Haryana, BJP; Shri Krishan Pal Gurjar, MOS, Govt. Of India; Brigadier Kuldeep Singh Chandpuri, Mahavir Chakra Awardee & VSM; Actor Sh. Ranbir Kapoor and Shri Vipul Goel, MLA& Chairman, Faridabad Navchetna Trust. The Tiranga, a symbol of our national pride, culture and identity, and emblematic of the hopes and aspirations of the people of India, was installed today under the leadership of Sh. Vipul Goel by the Faridabad Navchetna Trust to commemorate National Defence Day on 3rd March, 2015. Towering at a height of 250 feet (dimensions of Tiranga: 96 feet X 64 feet), The Tallest Tiranga filled the gathering of more than 10,000 people with great patriotic fervor as they looked up in awe and wonder at its majestic presence during the unfurling. Renowned Bollywood composer Mr. Sachin Jigar set the patriotic tone amid loud applause by the audience. The Tricolour hoisting also became a reaffirmation of the fact that patriotism is well and truly alive, teaching us lessons in love, culture, respect and discipline. Shri Manohar Lal said: “It is indeed a proud moment for the people of Haryana to witness such a path breaking moment. I thank Faridabad Navchetna Trust for living up to its name- it has truly brought about a whole new ‘chetna’ among the people of Haryana, fostering a sense of unity and patriotism. I feel overwhelmed to see so many people who have gathered here to recollect the glorious history of our freedom struggle and to pay respect to the soldiers who have believed in the Tiranga and fought for the country”. While thanking the administration and congregation, Shri Vipul Goel stated: “On its launch today, the Faridabad Navchetna Trust has also become a part of the nation’s historic moment by installing the world’s tallest Tiranga in Faridabad, Haryana. Faridabad Navchetna Trust is dedicated towards the transformation of the social and cultural life of Faridabad”. Dr. Amit Bhalla, Vice President, MREI & Trustee, Faridabad Navchetna Trust informed “Manav Rachna Educational Institutions have taken on the onus of maintaining and caring for the world’s Tallest Tiranga. As a symbol of India’s freedom struggle and a reminder of the martyrs who had laid down their lives in the service of the nation, The Tallest Tiranga is a true representation of the dreams of millions of people who are willing to fight against all odds to protect the unity and security of the nation”. On this momentous occasion, War Widows and Veer Naris were honoured along with Gallantry Awardees and Freedom Fighters.